The uniform is a sign of identity with the College and should be worn with pride. 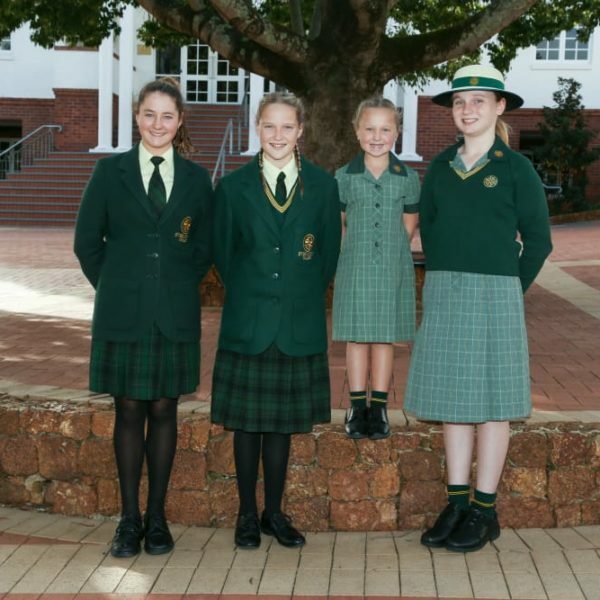 Each student is expected to be properly dressed in full uniform while at the College, travelling to and from the College and when representing the College at external functions. 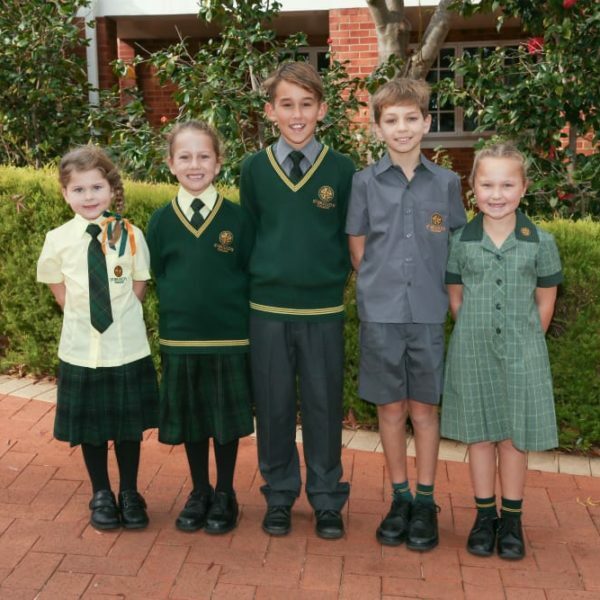 School uniforms may be purchased online or at the College Uniform Shop. Trading hours are currently Tuesday 3pm – 4pm and Wednesday 8:30am- 4pm or alternatively call 08 9290 4261 during opening times if you want to make a purchase. 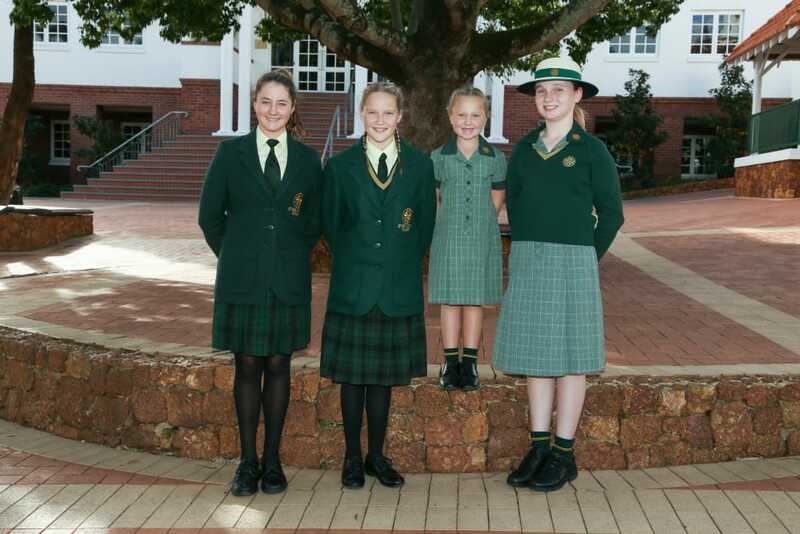 Second hand uniforms may be purchased through St Brigid’s College Second Hand Face Book page. If unsure on what you are purchasing, please contact the College Uniform Shop during the above opening times for help. Students must wear the yellow and green bucket hat. 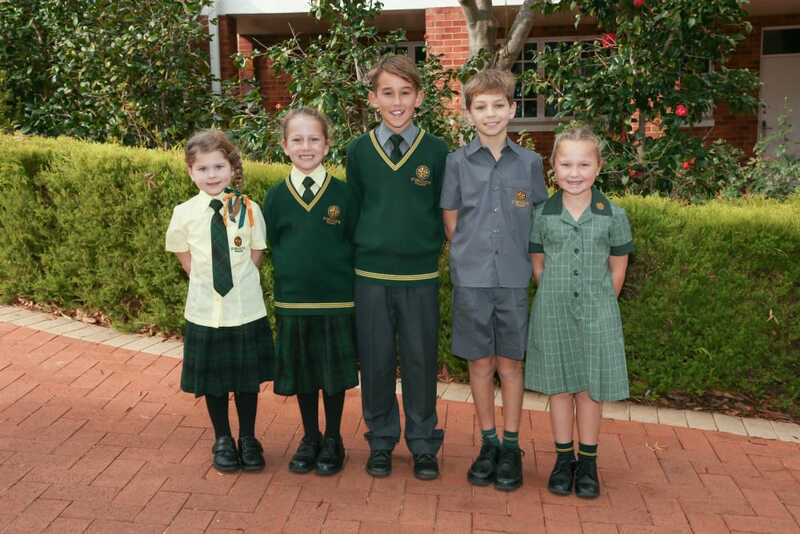 Kindergarten and Pre-primary students wear the College sports uniform all year round. All students must where the Bucket hat or Cap when in the college at recess or lunch. The blazer is not compulsory during the summer months but, with the tie, is part of the official uniform for all formal occasions. All students must wear either the boater or sports hat when in the College grounds at recess and lunch. Black stockings (70 Denier opaques) NOT socks. Stockings must not contain holes or ladders. Hat The College bucket hat or cap must be worn by students during outdoor activities and may replace the boater during break times when the student is in the sun. Students are expected to be well groomed at all times. Shoulder length and longer hair must be tied back at all times. Boys’ hair is to be off the collar and cut above the ears and eyes. Hair must be kept off the face and not restrict clear vision. Hair ties must be yellow or green and white (for Year 12 only). Hair tints and extreme hair styles are not permitted – colouring of hair in natural hair shades and styles (when in doubt, check with your class teacher/Year Team Leader BEFORE colouring your hair). A maximum of two pair of matching earrings – sleepers or studs only (two per ear to be worn in the lobe of the ear). Earrings should be small in size and either silver or gold in colour. Apart from Medic Alert bracelets, or a bracelet with religious/cultural significance, no other bracelets are permitted, unless permission granted from the appropriate Year Team Leader. Black leather school shoes must be worn for all Textile and Food Technology classes. Exactly how long should my dress or skirt be? Skirts must cover the knee when standing. Does my tie need to be done up properly all the time? Shirt top buttons should be fastened and ties pulled up at all times. I am cold in the mornings, which do I wear, my blazer or jumper? 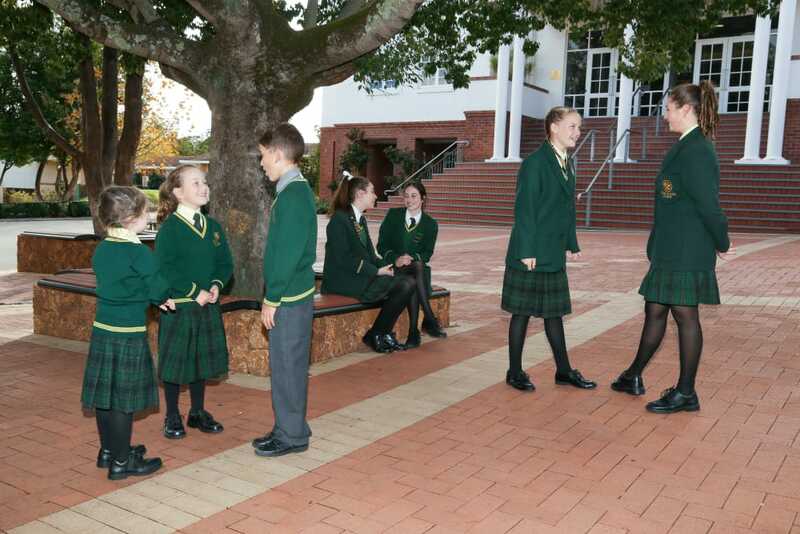 Blazers must be worn to and from school during Terms 2 and 3. They must be worn as students leave the school grounds and when they arrive in the morning. Blazers are also compulsory in Homeroom and are to be worn to classes until recess time. In addition, they are compulsory at all full school assemblies. Jumpers are an addition to the uniform, if you get hot during the day, you are to remove your jumper and wear your blazer (not the other way around!). 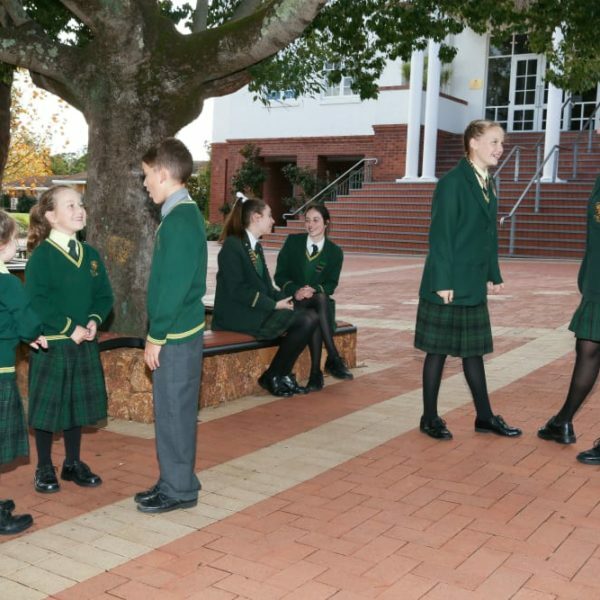 During Terms 1 and 4, you may wear the College jumper over their summer uniform if required for warmth, but only at the College. Can I wear singlets underneath my uniform? Singlets that show below jumpers are not allowed, these should be tucked in neatly into your skirt. Singlets are not to show through the blouse and should be either white or skin tone. I have Physical Education today, can I wear my College jumper instead of my tracksuit? Green College jumpers or yellow fleecy tops are not to be worn as a replacement for the tracksuit top. I know I need to wear my hair up, but what sort of hair ties do I use? Hair ties must be yellow or darkish (not fluorescent colours) green (and white for Year 12 students). Hair elastics that blend with hair colour (brown/ black etc.) are also able to be worn. I am thinking of colouring my hair, what colours can I choose? Many students have the ‘blonde-brown’ sun streaked look, which is okay as long as it is kept tidy. However, very noticeable ‘chunks’ of dyed hair are not acceptable. Students should have a natural looking hair colour. Well what about my footwear? Black lace up shoes are to be worn, slip-on shoes, canvas or buckles are not permitted to be worn. . I was given a bracelet for my birthday can I wear it to school? No bracelets can be worn except medic alert bracelets or bracelets that students never remove due to a strong religious or cultural conviction. In this case, parents must provide a letter of explanation to the school, and discuss the matter with a Year Team Leader. In terms of other jewellery students can wear two sets of small studs or sleepers in the bottom of the ear lobe. Large ‘diamond’, ‘pearl’ or coloured earrings are not permitted as part of the uniform., they do not count as studs. Only one plain ring is allowed. What shoes do I wear in cooking classes?